If you love Tropicana Sweets you'll love our Club Tropicana Jar of Joy! Our Club Tropicana Jar of Joy is full of your favourites! Whether you want a bit of fizz or something chewy Club Tropicana has it all. This colourful jar is sure to please any sweet lover who is looking for a way to satisfy their sweet tooth. 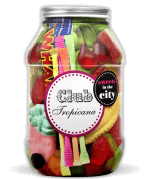 Dive into this jar or tasty treats and enjoy your stay at Club Tropicana! Product 1: Glucose-Fructose Syrup; Sugar; Water; Beef Gelatine; Humectant: Sorbitol; Flavourings; Colours: E100, E133. May contain traces of MILK. Product 2: Glucose Syrup, Sugar, Corn Starch, Beef and Pork Gelatine, Humectant: Glycerol; Acids: Citric Acid, Malic Acid; Gelling Agent: Pectins; Fruit and Vegetable Concentrates (Safflower, Lemon, Radish, Pumpkin, Apple, Tomato, Blackcurrant, Carrot), Flavourings, Colours: E100, E120, E133, E171. Product 3: Sugar; Glucose Syrup; Water; Gelling Agent: Pectin; Acid: Lactic Acid; Colours: Anthocyanins, Chlorophylls, Curcumin, Capsanthin; Flavourings; Plant Concentrates: Safflower, Spirulina. Product 4: Sugar, Maize Starch, Dextrose, Acid: E334, Acidity Regulator: E500; Flavourings, Colours: E100, E132, E162. Product 5: Glucose Syrup; Sugar; Modified Starch: Pea, Potato; Acid: E270, E330; Water; Vegetable Oil: Coconut; Flavourings; Colours: E100, E120, E141; Glazing Agent: E901. May also contain cereals containing GLUTEN. Product 6: Sugar; Glucose Syrup; Beef and Pork Gelatine; Dextrose; Acid: Citric Acid; Gelling Agent: Pectins; Flavourings; Thickening Agent: Arabic Gum; Glazing Agents: Beeswax, Carnauba Wax; Olive Oil; Vegetable Oils: Coconut, Palm Kernel; Fruit and Vegetable Concentrates: Lemon, Safflower, Carrot, Elderberry; Colours: E120, E153. Product 7: Sugar; Glucose Syrup; Water; Dextrose; Beef Gelatine, Cornflour; Colour: Curcumin; Flavouring. Product 8: Glucose syrup; Sugar; Water; Pork Gelatine; Maltodextrin; Acid: E330; Flavouring; Colour: E100, E120, E133; Vegetable Oils: Palm Kernel, Coconut; Glazing Agent: Beeswax, Carnauba Wax. Product 9: Dextrose; Sugar; Acidity Regulator: Citric Acid; Artificial Flavourings. Product 10: Glucose syrup; Sugar; Starch; Acid: Citric Acid; Flavouring; Fruit and Plant Concentrates: Aronia, Blackcurrant, Grape, Elderberry, Lemon, Orange, Safflower, Spirulina; Caramelised Sugar Syrup; Glazing agents: Beeswax; Carnauba wax; Elderberry extract. Product 11: Sugar; Glucose Syrup; Water; Pork Gelatine; Fructose; Corn Starch; Acid: Citric Acid; Colours: E100, E120, E141, E161b, E162, E171; Flavourings; Glazing Agent: Bees Wax. Cherries: Glucose syrup; Sugar; Gelatine; Dextrose; Acid: Citric Acid; Flavouring; Fruit and Plant Concentrates: Apple, Aronia, Blackcurrant, Grape, Elderberry, Kiwi, Safflower, Spirulina; Glazing agents: Beeswax, Carnauba Wax; Elderberry Extract. Product 12: Glucose Syrup; Sugar; Water; Pork Gelatine; Dextrose; Acid: Citric Acid; Flavouring; Colours: E104, E129, E133. Ingredients on wrapper: Wham Bar.